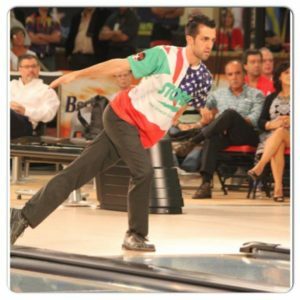 When professional bowler Scott Norton introduced us to Anthony Pepe last week we were very excited to talk to Anthony, winner of the 2014 Cheetah Championship in Las Vegas. He came out publically last Thursday on social media. When asked how his life has changed since the announcement, Pepe said “I no longer have to hide who I am as a person. Something I have been doing for a long time.” His decision to come out was a quick one. Pepe said he did not make the decision to come out until that morning. But once he made the decision he knew that he was “ready to commit” to coming out publically. Within hours of his announcement he had added 1,600 Facebook “Likes” to his fan page and new fans had made over 500 comments. Pepe was overwhelmed at the response but knew he had made the right decision to come out. While only bowling professionally for two years, Pepe has already won one championship. His short two year career, however, was preceded by 20 years of recreational and amateur bowling. Having picked up his first bowling ball at age six, the 26 year old still has a long and bright future ahead of him. You can catch Pepe at the PBA Summer Swing in Omaha, Nebraska on May 9-18 followed by a public appearance at the International Gay Bowling Organization’s 35th Annual Conference & Bowling Tournament, also being held in Omaha. Look for a feature story on Anthony in an upcoming edition of Compete.